Rocket Matter Knowledge Base Custom RatesHow to apply a custom billing rate for just one matter. Custom rates can be set on a matter-by-matter basis. If several timekeepers are billing time on the custom rate matter, separate custom rates can be applied for each timekeeper. Custom rates applied to an individual matter will not affect the timekeepers' overall Default Billing Rate. You may apply a custom hourly rate of $0 for Flat Fee and Contingency Matters. This enables you to track time on Flat Fee and Contingency Matters without charging the client additionally for the hours recorded. 1. 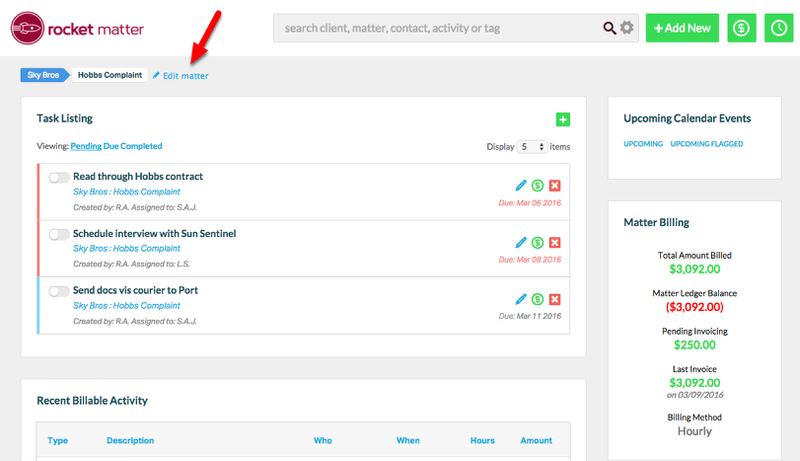 Navigate to the matter, and click "Edit Matter". 2. Click "I want to Set Custom Rates". Zoom: 2. Click &quot;I want to Set Custom Rates&quot;. 3. Fill in the custom rate, username, and custom rate application date. Click "Add Rate". - Let the username field auto-populate to ensure that the correct user is recorded. - Custom Rates can be applied RETROACTIVELY. Selecting a date in the past will retroactively apply the custom rates you specify. - Custom Rates cannot be applied to billable items which have already been invoiced. You must select a date which is later than the most recent invoice date. - When a custom rate is applied retroactively, we recommend that you review your Billable Activity for billing accuracy before you run an invoice. 4. If multiple timekeepers are billing on the custom-rate matter, apply a custom rate for each timekeeper. Zoom: 4. If multiple timekeepers are billing on the custom-rate matter, apply a custom rate for each timekeeper. 5. Click "Back" to return to the Edit Matter screen. Zoom: 5. Click &quot;Back&quot; to return to the Edit Matter screen. 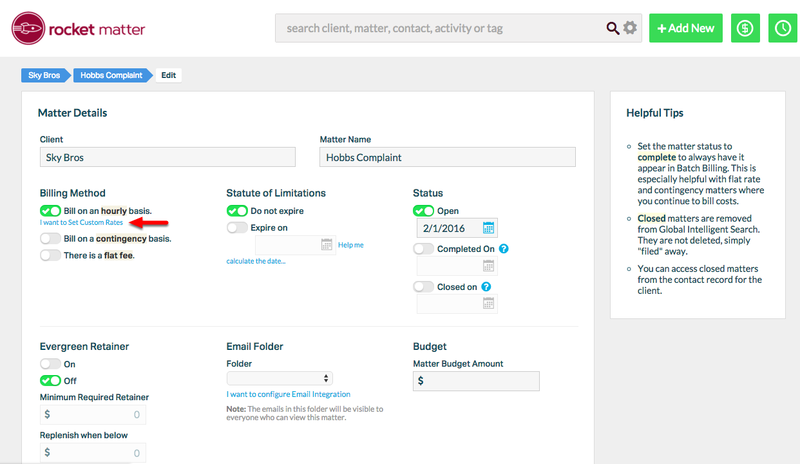 Prev: How to add a Client Custom Fields for a single matter. Next: How to add/edit custom rates in bulk.